RANSAC (RANdom SAmple Consensus) algorithm. 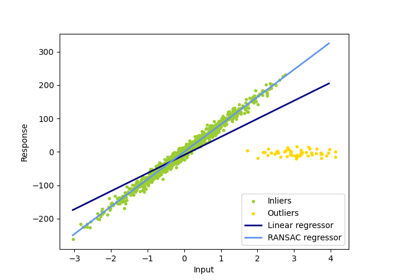 RANSAC is an iterative algorithm for the robust estimation of parameters from a subset of inliers from the complete data set. More information can be found in the general documentation of linear models. A detailed description of the algorithm can be found in the documentation of the linear_model sub-package. fit(X, y): Fit model to given training data and target values. score(X, y): Returns the mean accuracy on the given test data, which is used for the stop criterion defined by stop_score. Additionally, the score is used to decide which of two equally large consensus sets is chosen as the better one. 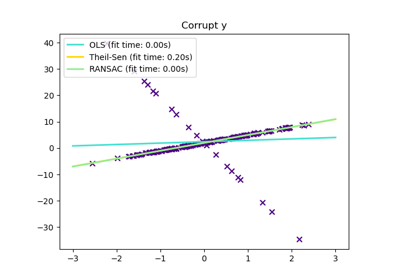 predict(X): Returns predicted values using the linear model, which is used to compute residual error using loss function. 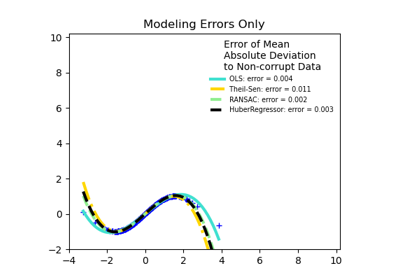 If base_estimator is None, then base_estimator=sklearn.linear_model.LinearRegression() is used for target values of dtype float. Note that the current implementation only supports regression estimators. Minimum number of samples chosen randomly from original data. Treated as an absolute number of samples for min_samples >= 1, treated as a relative number ceil(min_samples * X.shape) for min_samples < 1. This is typically chosen as the minimal number of samples necessary to estimate the given base_estimator. By default a sklearn.linear_model.LinearRegression() estimator is assumed and min_samples is chosen as X.shape + 1. Maximum residual for a data sample to be classified as an inlier. By default the threshold is chosen as the MAD (median absolute deviation) of the target values y. This function is called with the randomly selected data before the model is fitted to it: is_data_valid(X, y). If its return value is False the current randomly chosen sub-sample is skipped. This function is called with the estimated model and the randomly selected data: is_model_valid(model, X, y). If its return value is False the current randomly chosen sub-sample is skipped. Rejecting samples with this function is computationally costlier than with is_data_valid. is_model_valid should therefore only be used if the estimated model is needed for making the rejection decision. Maximum number of iterations for random sample selection. Maximum number of iterations that can be skipped due to finding zero inliers or invalid data defined by is_data_valid or invalid models defined by is_model_valid. Stop iteration if at least this number of inliers are found. Stop iteration if score is greater equal than this threshold. where the probability (confidence) is typically set to high value such as 0.99 (the default) and e is the current fraction of inliers w.r.t. the total number of samples. String inputs, “absolute_loss” and “squared_loss” are supported which find the absolute loss and squared loss per sample respectively. If loss is a callable, then it should be a function that takes two arrays as inputs, the true and predicted value and returns a 1-D array with the i-th value of the array corresponding to the loss on X[i]. If the loss on a sample is greater than the residual_threshold, then this sample is classified as an outlier. The generator used to initialize the centers. If int, random_state is the seed used by the random number generator; If RandomState instance, random_state is the random number generator; If None, the random number generator is the RandomState instance used by np.random. Best fitted model (copy of the base_estimator object). Number of random selection trials until one of the stop criteria is met. It is always <= max_trials. Boolean mask of inliers classified as True. Number of iterations skipped due to finding zero inliers. Number of iterations skipped due to invalid data defined by is_data_valid. Number of iterations skipped due to an invalid model defined by is_model_valid. fit(X, y[, sample_weight]) Fit estimator using RANSAC algorithm. predict(X) Predict using the estimated model. score(X, y) Returns the score of the prediction. Fit estimator using RANSAC algorithm. Individual weights for each sample raises error if sample_weight is passed and base_estimator fit method does not support it. If no valid consensus set could be found. This occurs if is_data_valid and is_model_valid return False for all max_trials randomly chosen sub-samples. Predict using the estimated model. This is a wrapper for estimator_.predict(X). Returns the score of the prediction. This is a wrapper for estimator_.score(X, y).